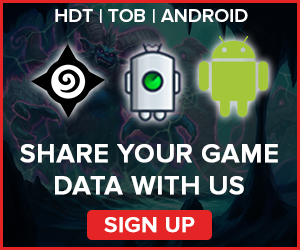 A weekly Hearthstone Meta Report based on data from over 145,000 games. 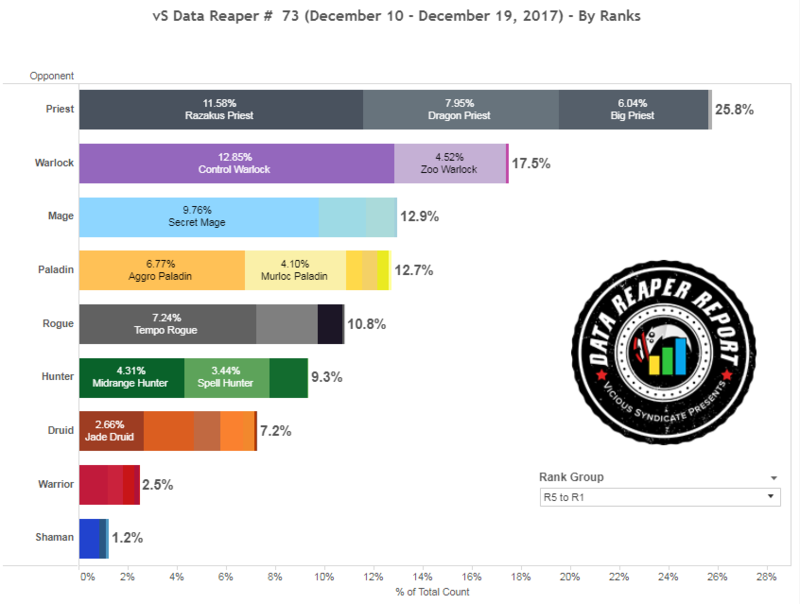 Welcome to the 73rd edition of the Data Reaper Report! This is the first report for Kobolds & Catacombs. In an unexpected fashion, Priest dominates popularity at nearly all levels of play, and is the clear frontrunner at legend where it’s nearly 30% of the field. Razakus Priest, an archetype mostly unchanged from KFT, is the most popular deck at higher levels of play. While there are experiments with Dragon packages in Razakus, the full cycle variants are the most popular. Dragon Priest is the 2nd most popular Priest archetype, with the Satellite Spiteful Summoner variant gaining significant traction. Big Priest closes the list of Priest archetypes you have to fear, and you have to fear them all. Warlock catapults itself to the 2nd spot, on the back of Control Warlock’s resurgence. Control Warlock is still very much in an experimental stage, with many approaches being tested. It’s slowly getting there, and we’ll have to see what lies at the end of its refinement stage. We assess that the best approach is far from figured out. Zoo Warlock has also stuck around, though its popularity is much lower. Many things were experimented in the Rogue class, but as time went on, Miracle builds and Kingsbane-focused builds have begun to fade away, while Tempo Rogue has gradually climbed back up in play. At legend ranks, Tempo Rogue is already the 3rd most popular deck behind Razakus Priest and Control Warlock. Fueled by Explosive Runes and Aluneth, Secret Mage has exploded on ladder and established itself as one of the most prevalent archetypes. Other Mage archetypes aren’t so lucky. Exodia Mage has retained a niche representation, while slower Mage decks have mostly focused on the Big Spell builds centered on Dragon’s Fury. The Control/Freeze variants of KFT vanished into thin air. 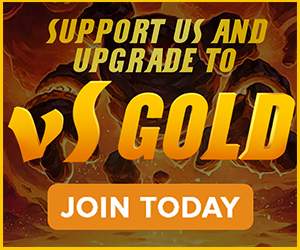 Paladin has been another big winner of the expansion, with aggressive archetypes climbing in play as a result of one of the strongest cards in the K&C set, Call to Arms. Aggro Paladin is slightly more popular than the tribal focused Murloc Paladin. Hunter has seen two contrasting trends. In the first few days of the expansion, Spell Hunter was a very popular archetype and continues to be the most prevalent Hunter deck at lower skill levels. It has continuously declined since then. However, minion-focused Hunter builds have behaved in an opposite manner, gaining traction and slowly increasing in representation. At legend ranks, Midrange Hunter is the most popular archetype by a fair margin. Note that the latest builds have been leaning to the aggressive side, cutting Highmanes and adopting a Hybrid approach, though they can easily flip the switch to the other end of the spectrum. Druid is the most fractured class in the meta. Many different archetypes are being tested, and within some of them, there are multiple approaches. It’s interesting that arguably the most dominant class of 2017 is currently struggling to establish more than a niche representation on ladder. That could easily change, but it’s definitely new territory for Druid. Warrior has shrunk even further. There are small populations of Pirate Warrior, and Big Warrior, which is focused on cheating out large threats in a similar fashion to Big Priest by utilizing Gather Your Party/Woecleaver. Control Warrior archetypes have quickly devolved into a barren wasteland. Things look even grimmer for Shaman, as the class has collapsed in its popularity since launch, and is continuing to decline further. Token Shaman is the only truly visible archetype that looks like a Hearthstone deck, and there’s not much else. No interest in playing or innovating whatsoever. 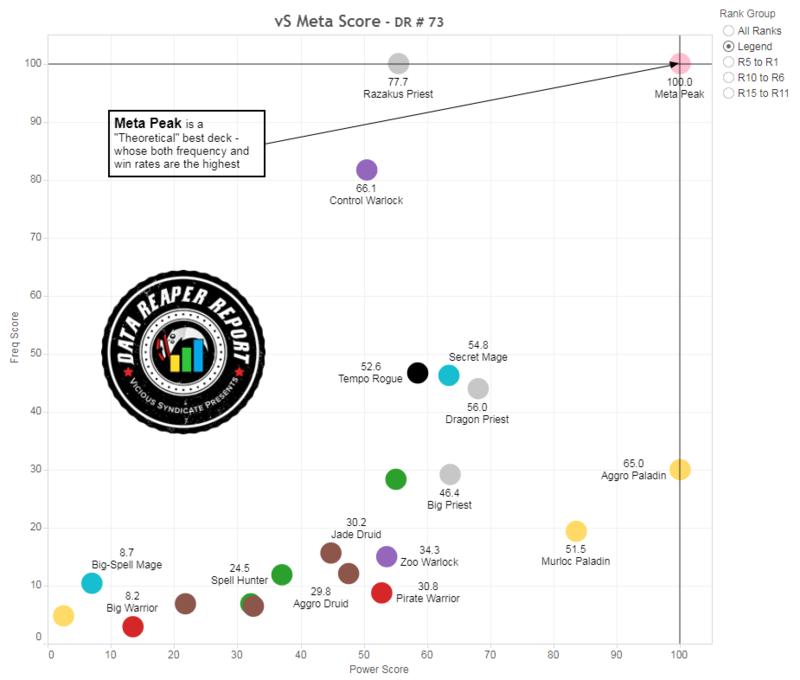 There are a lot of interesting trends to discuss looking at the performance level of decks, but before we do that, remember that we’re at a very early stage of the meta. Archetypes are at different stages of refinements and as a result, we have to dig deeper into their data in order to predict where they might be headed. In the following paragraphs, we will be doing exactly that. 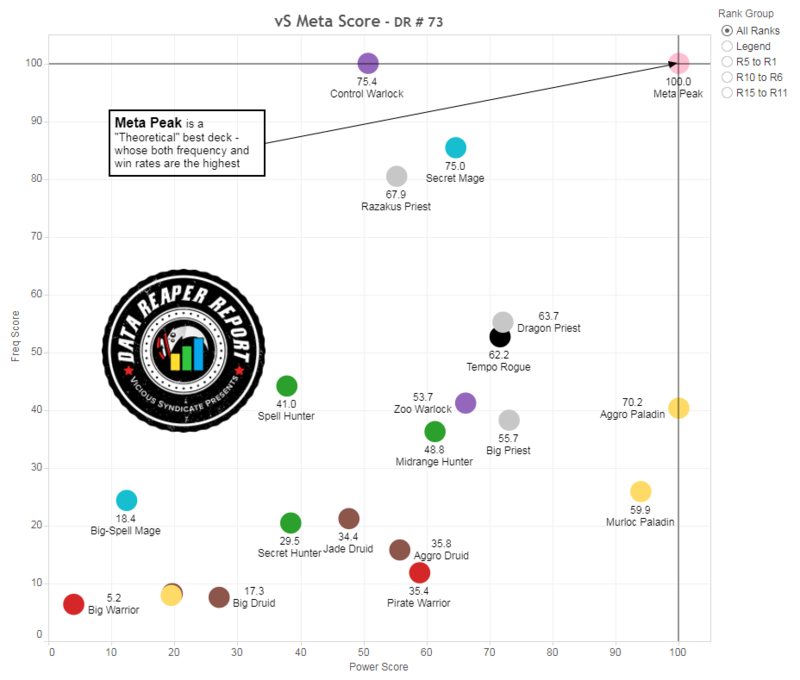 Note that in this report, we’re introducing the “vS Meta Score”, a new metric to measure an archetype’s standing in the meta, factoring in both prevalence and win rate. 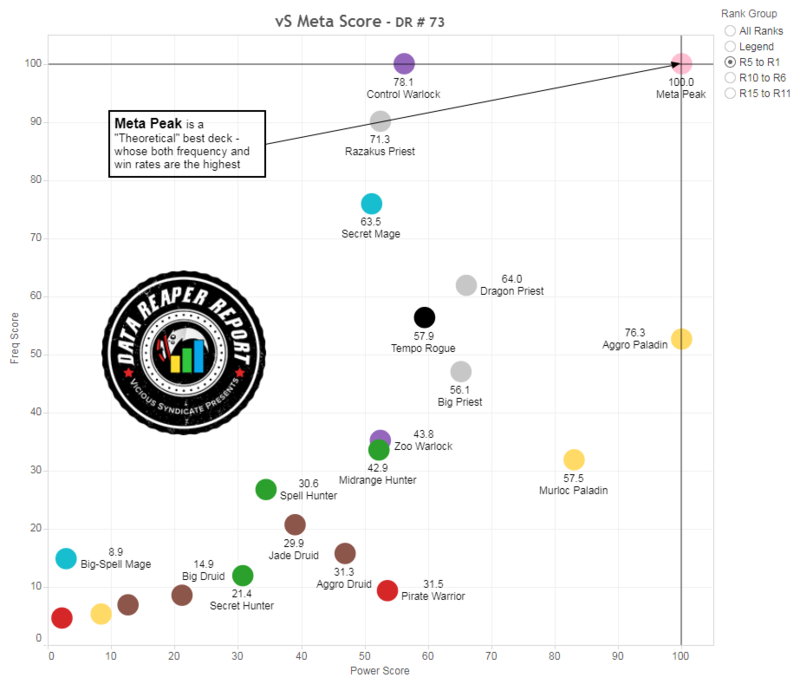 For an explanation of what is the Meta Score, you can read the following article. While the snapshot captures the current meta quite nicely, things will get more interesting next week when we’re able to pinpoint trends. 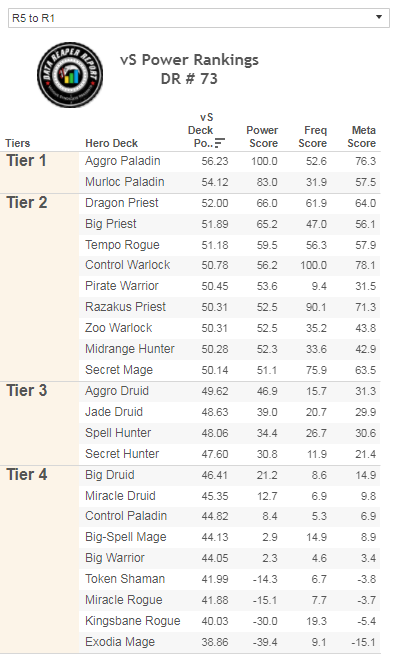 It’s very clear that in terms of its performance, Paladin is far ahead of the field at the moment. Aggro Paladin’s win rate, in particular, is quite absurd. It is ahead in its development than other decks, and it is likely to rise in play in the coming weeks, taking advantage of the fact that most of the attention is focused on beating Priest and Warlock. What we find most interesting is that its perceived counters are not nearly as intimidating as they appear to be. While Murloc Paladin clearly struggles against Control Warlock, Aggro Paladin does far better in this matchup, and can easily adjust with tech to perform even better. The hardest counter to Paladin is actually Tempo Rogue, as the Rogue’s control of the early game is still second to none and it can beat the Paladin off the board before Call to Arms becomes an oppressive threat. Priest looks very scary to us for several reasons. It has three archetypes that currently boast very strong win rates. Dragon Priest was below 50% last week, then Satellite’s ‘Big Spell’ variant gained traction and the rest is history. It has climbed all the way up to a T1 win rate at legend. Dragon Priest has a terrific matchup spread, with one hard counter: Aggro Paladin. Big Priest and Razakus Priest are mostly unchanged archetypes but the small additions they received this expansion helped them a lot. Big Priest annihilates Warlock, which means is it likely to gain value should Warlock continue to rise in popularity. Razakus Priest also does very well against Warlock, and greatly benefits from Druid’s fall in popularity. Considering that Razakus Priest is a very flexible archetype, it will likely continue to dominate prevalence while maintaining a respectable win rate going forward. Much like Razakus Priest is shaping the meta around its dominant late game, Tempo Rogue is quietly shaping the meta around its dominant early game. It’s still very hard to take the board off of Tempo Rogue and establish initiative, which means it’s a fantastic choice if you’re encountering a lot of aggressive decks. Moreover, it’s going to be a very important archetype going forward considering its consistency at beating Paladin. While Priest does fairly well against Rogue, the only true hard counter to the archetype is Control Warlock. Control Warlock was probably the most interesting archetype for us to evaluate. At the very early days of the expansion, its win rate was quite poor. However, new discoveries and innovations over the last week have been steadily pushing this archetype’s win rate, and it now surpasses the 50% mark. 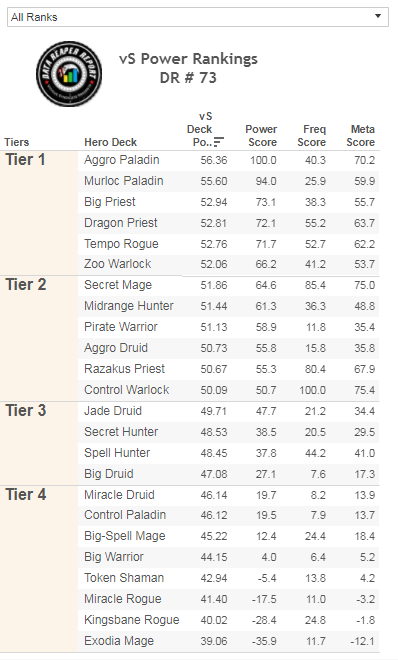 We expect Warlock to continue to improve further considering that out of all the top meta decks listed, we identify its scope for improvement to be the largest. However, there are some road blocks that may prevent Control Warlock from being “too good”. The first is the fact that its primary game plan against aggressive decks can be significantly hindered with a Spellbreaker. The card isn’t very popular yet, but should rise in play if Warlock maintains high prevalence. The second issue is Priest. Control Warlock struggles against most Priest decks, which currently significantly suppress its win rate. Not that this is a bad thing. 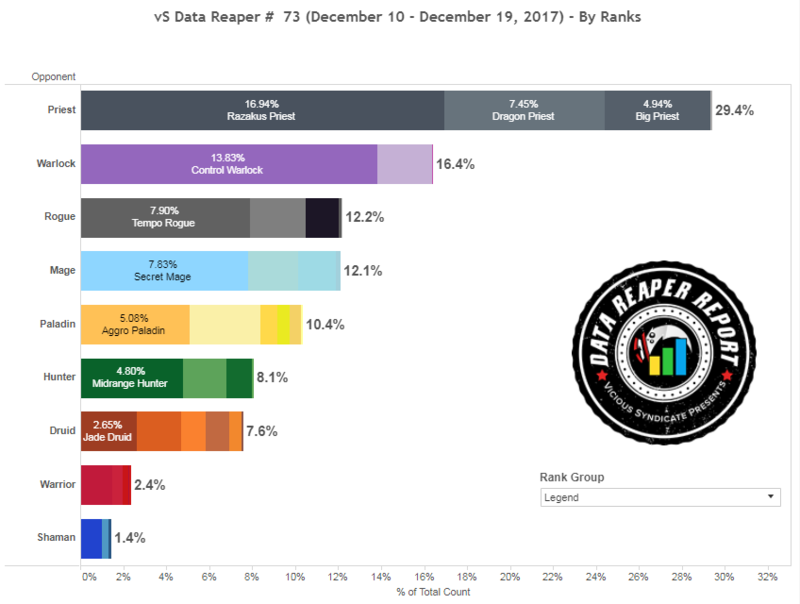 It’s a good sign that the most popular decks don’t carry the highest win rates, meaning they are less likely to grow further in popularity (there are enough Priests on ladder already!). Considering that it punishes board-centric, tempo-focused decks, Control Warlock is emerging to be a healthy deck for the meta and will likely be a key tournament deck. Secret Mage is, perhaps, the most polarizing deck in the format. In a Priest/Warlock meta, it can certainly thrive since it holds an advantage against the two most popular archetypes in the game. However, it struggles when facing an aggressive opponent that can flood the board and deny it space to operate. Decks such as Tempo Rogue, aggressive Paladins and Hunter can certainly punish the Mage. However, the aforementioned advantages are enough to keep Secret Mage’s win rate in a very good spot. There were many complaints about the state of Hunter before the expansion and these concerns appear to have been soothed to an extent. While Spell Hunter did receive a lot of hype early on, it was quickly found out. Both Priest and Warlock are capable of sitting back as the Spell Hunter lacks consistent minion development. The archetype’s win rate has been on a steady decline and we expect it to fizzle out. However, Hunter decks that play minions look quite strong, with the Midrange cluster showing promise. We’re always a bit worried about Hunter since it tends to look worse as a meta begins to settle, but the class is likely to find a competitive spot in the meta. Other decks that are doing relatively well but aren’t seeing too much play are Zoo Warlock and Pirate Warrior. Zoo seems strong enough to not fall far behind the rest of the meta as refinements are made. With Pirate Warrior, we’re a bit more concerned since its scope for improvement appears to be very limited. Considering that other Warrior archetypes are doing really poorly (We have limited data on Control/Taunt Warrior, and they’re pretty much in the dumpster), it’s not shaping up to be a great expansion for the Warrior class. No Druid deck is currently boasting a win rate that exceeds 50%. Let that sink in for a minute. While Druid isn’t doing that great, it’s definitely foolish to rule it out this early. Jade, Aggro and Big Druid are definitely not that far away from being strong archetypes, and we can see them improving with some adjustments, but the power level of this expansion was definitely high enough to give the class some serious challenges going forward. 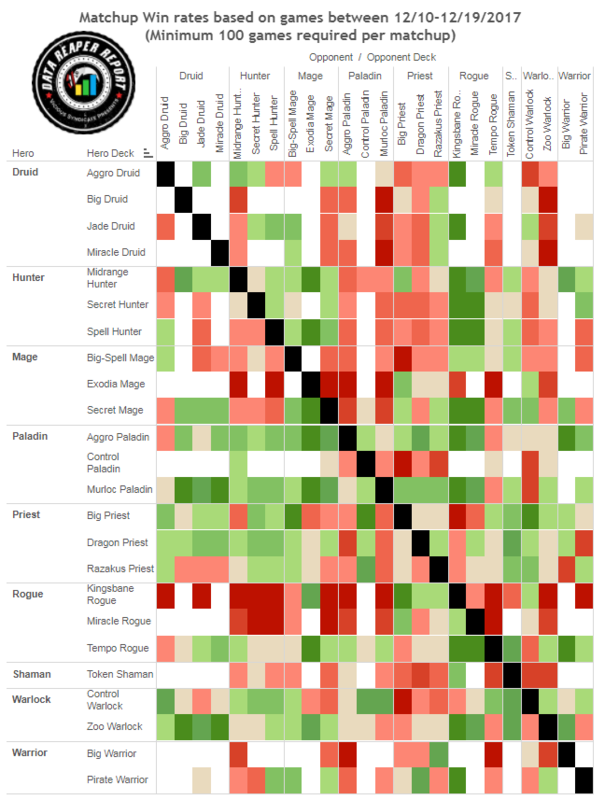 Out of the poorly performing archetypes buried in Tier 4, are there any potential gems hidden? Big-Spell Mage is one deck we feel looks worse than it probably is. It is still an experimental mess and we can definitely see it jump out of the gutter if it settles on a consistent shell. Miracle Rogue is in a spot where it’s trying to do too many things that don’t necessarily make sense in the context of the meta. Finally, let’s talk about Shaman. Poor Shaman is paying for the sins it has committed a year ago. After suffering from glaring weaknesses during KFT, a time in which it still looked ‘alright’ in terms of its win rate; it has now collapsed into the dumpster. Two sets filled with bad memes, and a meta in which the two most popular classes have, what feels like, a billion different forms of AOE is a deal breaker for the most board reliant class in the game. Things are not hopeless for Thrall, but they’re quite bleak and there is a danger that Shaman will enter “Hunter in MSG” territory. After years of Priest being mediocre at best, unplayable at worst, the reign of Anduin throughout the second half of 2017 is quite the turnaround. Priest currently boasts three very powerful archetypes, with diverse builds and approaches, exhibiting seemingly endless possibilities. Big Priest didn’t necessarily need too many adjustments outside of Diamond Spellstone, and perhaps Psychic Scream, which has also found a home in the deck. The archetype’s powerful set of tools, its ability to blow out any matchup with a turn 4 Barnes, and its late game sustainability with the Spellstone increasing its threat generation by a significant margin, makes it an incredibly resilient force on ladder. It is also the hardest counter to Control Warlock in the game, even more so than Razakus Priest. Dragon Priest is also looking extremely strong and has been climbing in its win rate steadily since the beginning of the expansion. It currently has two main variants, with the difference being its primary win condition against control decks. The first approach is similar to Dragon Priest builds of the previous expansion, including the Divine Spirit/Inner Fire combo which took Windello to #1 legend. The second approach runs the big spell package of Spiteful Summoner, Grand Archivist and Free from Amber/Mind Control. This build took Satellite to top legend ranks multiple times, and we’re featuring his latest build that runs Faerie Dragons instead of Shadow Ascendants as well as a Spellbreaker replacing one Corridor Creeper. This build is surprisingly irritating for Warlock to deal with since, unless they’re cheated out, Voidlords almost become liabilities late game due to a potential Mind Control, which allows the Priest to grind out the Warlock quite often. This leaves us with the most popular deck in the game and arguably the most versatile, Razakus Priest. The archetype has only benefited from the new expansion even though its most popular variant hasn’t added new cards from the Kobold set other than Psychic Scream. The fall in ramping Druid decks that were always capable of giving Priest fits, as well as the rise of Control Warlocks, which are very susceptible to the Raza/Anduin combo, means it’s not easy to find a successful ladder deck that can beat Razakus consistently, or a successful tournament line up that targets it as well. While there have been experiments with dragon packages, the standard cycle build that includes either Lyra or Auctioneer have proven to be the most consistently successful so far. We recommend, until the meta settles a bit more and clear adversaries are marked, to run a tech light build that has strong all-around cards. Control Warlock is back in a big way with the release of K&C. Almost all of its concerns have been addressed – there’s an incredible anti-aggro tool in Voidlord that can be cheated out early, multiple new life gain cards, and a recently discovered strong finisher to address Control Warlock’s lack of win condition. Let’s start with Voidlord. This card is a brick wall against aggressive strategies and complements the variety of early board clears to completely clog the board and eliminate pressure. Skull of Man’Ari and Possessed Lackey are both seeing play as ways to cheat it out and stop any aggression in its tracks. Warlock has also benefited from Dark Pact and Amethyst Spellstone, both offering a way to stabilize your health total and step out of critical burn range. Along with Defile, which was a busted card waiting for a stronger shell, Control Warlock has become the dominant anti-aggro archetype of this meta. The most important development of the archetype so far has been DUE_Nest’s discovery of the combination of Skull of Man’Ari, Doomguard, Spiritsinger Umbra, Carnivorous Cube, and Dark Pact for a 25 damage burst from hand. Since then, most Control Warlocks have adopted the “Cube package” and exploded in popularity, with Dog hitting #1 legend with an iteration of the deck that includes Rin, the First Disciple. The list we’re featuring is Dog’s latest build, but drops Rin for a Spellbreaker, which can be considered a flex card. Rin is a strong card in the mirror but has anti-synergy with the weapon, which might make her a better fit for weapon-less lists. Other options include running N’Zoth, which is another late game Voidlord generator, as well as Ooze. Control Warlock is far from figured out and will likely continue to change. A slightly different take inspired from Abar was piloted by Zalae to hit #9 legend and then Posesi to hit #1 (we’re featuring the Posesi list which replaces Spellbreaker with Umbra). This list runs Mountain Giants and takes a more aggressive approach that looks to pressure early and cuts some of the more reactive and situational cards in the deck. The main goal of the archetype going forward, at least for ladder, is to try and find a way to solve the “Priest problem”. 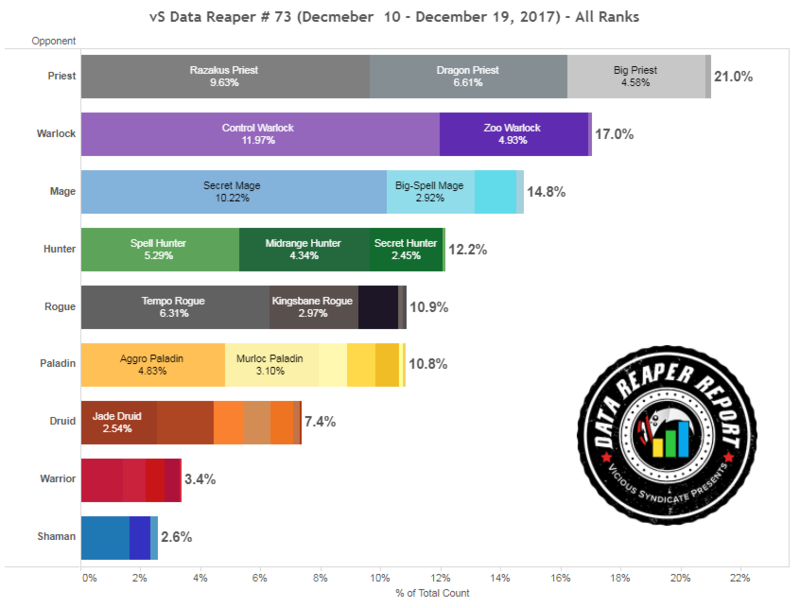 Considering the poor matchup with Razakus, and an even worse one against Big Priest, it will be difficult for Warlock to become a dominating deck in terms of its win rate unless it’s able to shave off percentages against the most popular class in the game. If Warlock remains popular, other decks will also look to target it, which we’re beginning to see with Spellbreakers appearing more often. In the tournament scene, Warlock’s fantastic matchups against aggressive decks as well as the availability of a Priest ban makes it a staple in the format. Zoo Warlock has not been as visible as Control Warlock, but the deck still seems strong enough to be very competitive. It has two main approaches. The first keeps Keleseth and retains a similar shell to the KFT Zoo Warlock, which can be seen in Xixo’s list. The second approach cuts Keleseth to take advantage of Vulgar Homunculus, and the increased presence of early demons allows both Demonfire and Bloodfury Potion to perform very well and enable some explosive openings that are hard to deal with. Amnesiac hit #1 legend with such a demon heavy list. Miracle Rogue saw some early innovation with Fal’dorei Strider giving hope to the archetype. However, it hasn’t seen much success since. Miracle Rogue’s one powerful tool in the current meta is Sap, which is a very good answer to a Voidlord. Mr. Yagut hit legend with a list that omits the slow Arcane Giants, and runs a burst package with Leeroy/Cold Bloods instead. With this build, you’re looking to tempo out and kill Priest and Warlock relatively quickly with the reach provided by Leeroy rather than taking the game long and allowing them to stabilize. Quest Rogue has seen some experimentation with the release of Sonya Shadowdancer, and players are utilizing the archetype in order to counter a narrow Priest meta. Zola the Gorgon and Elven Minstrel are also new additions that help the deck find its minions and bounce them more consistently. Cocosasa reached #2 legend with a build that tops out at Valeera the Hollow. Dog paired Rage’s Kingsbane Mill Rogue deck with his Cube Control Warlock to reach #1 legend. This deck also saw the return of Blade Flurry; Will it finally find some use with Kingsbane? 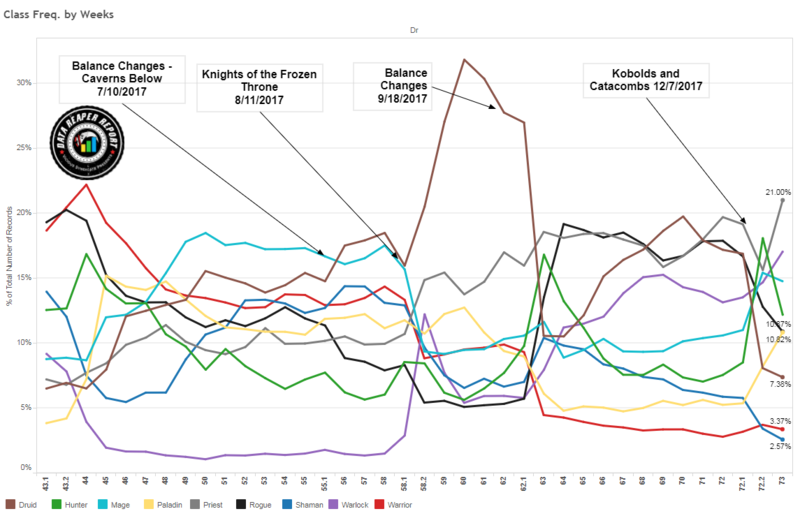 Kingsbane lists have mostly been performing very poorly on ladder and it remains to be seen whether the legendary weapon will find a place in the meta after the dust settles. Tempo Rogue remains the dominant Rogue archetype and one of the better performers in the current meta. However, due to it only gaining a few new cards in the form of Corridor Creeper and Elven Minstrel, its representation has significantly dropped as people aren’t as keen to revisit a known deck at the moment. However, that may change. BoarControl, who is well known for his accomplishments with the archetype during KFT, took Icer’s list to #1 legend. This build is the gold-standard for ladder lists. Saronite Chain Gangs are superior to Tar Creeper due to their ability to both protect the Rogue as well as apply sticky pressure. Cobalt Scalebane is still a threat you want against Priest, and players are cutting it mostly in tournament line ups that ban Priest. If you’re running into many Warlocks, cutting a Chain Gang for a Spellbreaker has merit, as the tech silence can often swing the game in your favor in a matchup that can be fairly difficult without it. Mage is, not so secretly, looking pretty strong this expansion on the back of Secret Mage’s success. Explosive Runes has given a massive boost to Secret Mage and is one of the deck’s best cards. If played on turn 3, it guarantees killing the opponent’s next minion while also providing direct face damage. Combined with Kirin Tor Mage or Kabal Lackey, Explosive Runes enables a big tempo swing that’s hard to recover from and cannot be played around as easily as Mirror Entity. Corridor Creeper is an all-around very good addition that can be cheated out early, while Aluneth is the cornerstone card that once played, turns the Mage into a spell slinging force that’s very difficult to outlast. After Zlsjs’ #1 legend achievement last week, multiple players have continued to see success with the archetype at top legend ranks. Xeno hit #5 legend running a list that cuts Kabal Lackeys, while Orange hit #4 with a build that omits Arcane Intellect and runs Pyroblast. Pyroblast is a very important card in the matchup against Control Warlock, as it often is the difference in having enough damage to finish them off through their multiple healing cards. In a meta dominated by Razakus Priest and Control Warlock, Secret Mage looks very good, but has to be wary of aggressive matchups which can be a struggle. The second most prevalent Mage archetype is Big Spell Mage. It relies on a plethora of AOE centered on Dragon’s Fury, which is a very powerful board clear against aggressive decks. Arcane Artificer and Frost Lich Jaina provide health stabilization, while the deck also carries many late game bombs in order to do better in slower matchups. Razakus Priest, however, is a very difficult opponent, which means the archetype has a better chance to be relevant in the tournament scene. Exodia Mage has reverted to its old Quest build as the quest-less experimentation with Leyline Manipulator during K&C’s early days does not appear to have panned out. Control/Freeze Mage has struggled to gain any footing in the current meta, with both Priest and Warlock easily capable of healing through its Alex/burn plan. Paladin is an extremely strong class right now. Call to Arms has elevated aggressive variants to the top of the win rate charts and both Aggro and Murloc Paladin are proving to be very powerful, with a select few strategies capable of consistently fending them off. Guntofire’s build is the standard Aggro Paladin shell, and there is very little deviation from it, since Knife Juggler and Dire Wolf Alpha provide the most front loaded power at the 2 slot. Danswf’s build, which Meati took to #2 legend, runs Scalebanes as a nod to the Priest matchup. The most important card in the deck and your number #1 mulligan target is Call to Arms, as it enables crazy board swings with the power of divine shields, taunts, and knives. Unidentified Maul is a superstar as well, as every battlecry it can gain has the potential to be game changing if not outright game winning. Having a second 3-cost weapon also makes it easier to justify having Pirates in the deck, which is incredibly important, as Patches is prime Corridor Creeper food, in addition to being the busted early game card it has always been. If you’re running into a lot of Warlocks, consider teching in a Spellbreaker in order to remove the threat of a Voidlord blocking your path to the face. Murloc Paladin has almost the same game plan as the non-tribal Aggro lists, but runs a synergistic shell of murlocs rather than the individually powerful cards from the Aggro lists. This deck can be a little more vulnerable to AOE since it needs to stick creatures on the board, but can also snowball harder than any deck in the game. Standard lists slightly vary, as there is a little debate between Ender’s build that includes Grimscale Oracles and ARAI’s build which runs Bluegill Warriors. Both players hit #1 legend with their respective takes. In addition to the “standard” murloc lists, a really interesting variant of Murloc Paladin has popped up and taken to great success by players such as Xixo. This variant includes a package of Spiteful Summoners and Dinosize. These builds look to improve percentages against slower decks since the additional threats towards the mid/late game can be quite difficult to deal with for decks that run AOE and/or generally do well against wide boards. In off-meta news, Aclon hit high legend near the beginning of the expansion with a Control Paladin list that runs Benevolent Djinn and Plated Beetle for early game stall, and N’Zoth as the late-game win condition. Control Paladin, as expected, has a mountain to climb when it comes to dealing with the meta tyrant known as Razakus Priest. Value win conditions just don’t fare well against the sheer amount of damage Priest can dish out once it has assembled its combo pieces. Hunter has seen a solid amount of experimentation since the launch of Kobolds & Catacombs, with players testing out all the new tools the class has received, mainly supporting non-minion builds and secret builds. But after the first week, most players have figured out the dominant build of Hunter: Hybrid Hunter, which is essentially the Midrange Hunter cluster evolving into dropping Highmanes and adding Pirates. Candleshot enables the inclusion of the pirate package while Dire Mole give the deck the consistency it desperately needed on turn 1 to compete with other aggressive decks and land Crackling Razormaw more often. Corridor Creeper, needless to say, is an incredible card which is even better in Hunter due to its beast tag. Against other aggressive decks, it is not out of the realm of possibility to go Corridor Creeper/Houndmaster on turn four or five, providing an insane tempo swing. Most of the variance between builds right now comes in the 4/5 mana slots. Mariana’s #1 legend build runs Spellbreaker, which is a popular tech against Warlocks, while Urana’s #2 legend build includes Bittertide Hydra to top out the Hunter’s curve with a big threat. Dark’s #4 legend build runs Flanking Strikes instead of Golakka Crawlers and Scalebanes in the 5 slot to give Priest more trouble. The archetype that received the most hype in the early days of the expansion was Spell Hunter. Bragis, who’s already achieved ladder success with the archetype before the expansion, piloted his take on the archetype to #1 legend. The list doesn’t bother with To My Side, as it is too awful when you don’t draw the Barnes, but includes Rhok’delar due to the upside being so significant when it hits. The final archetype of Hunter that was explored in the first couple weeks is Secret Hunter. Development of lists, however, has halted soon after the release of the expansion. Players realized that rather than playing a reactionary style where you would eventually flip the game with swing turns, it was just better to have a solid turn one and moved over to Hybrid Hunter. Druid finds itself struggling against the onslaught of aggressive decks built around cards such as Call to Arms and Spiteful Summoner. Spiteful Summoner in particular preys on Druid’s weak removal tools. On the other end of the spectrum, Aggro Druid struggles to land a footing due to the prevalence of Razakus Priest and Control Warlock, archetypes that carry so much AOE that developing a wide board against them becomes extremely difficult. Not a single Druid archetype has a win rate that exceeds 50% this week, but don’t count the class out, as it’s still early days and the class has some very powerful tools that could keep it relevant going forward. Asmodai hit #1 legend with a Big Druid list that runs the combo of Master Oakheart and Dragonhatchers. Sleepy Dragons replace Primordial Drakes since they’re more powerful recruit targets. There is a strong argument to include Drakkari Enchanter since it power ups the incredible swing turn that Master Oakheart enables. Medivh is omitted since it’s too slow against the faster decks of the meta and doesn’t have an immediate impact. Jade Druid is currently split between two approaches. The first, taken by Horo to #8 legend, looks similar to the standard list of KFT and adds Arcane Tyrants and Branching Paths. Arcane Tyrant is a great card in Jade Druid since it enables bigger tempo swings through Spreading Plague, Nourish and Ultimate Infestation. Branching Paths is a very flexible card that increases your draw consistency and gives you a burst of armor to defend yourself against Secret Mage’s burn plan. 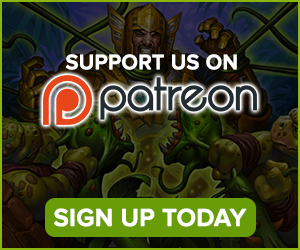 The second approach, exhibited by Casie & Bunnyhopper’s list, includes the Oaken Summons package with Ironwood Golem, Greedy Sprite and Jasper Spellstone. This build helps you match up better against aggressive decks. Aggro Druid has always been more efficient than other aggressive decks at going wide, and it is currently sporting good win rates against the faster decks of the meta as a result. Its stumbling blocks, as mentioned, are Priest’s and Warlocks’ hefty removal suites. Spellbreaker is a popular tech against Warlocks while Bittertide Hydra allows you go taller against AOE. The new expansion brings some good news to Warrior – it’s no longer the least popular class. Of course, it’s now the second-least popular, ahead of only the truly wretched Shaman. Pirate Warrior remains by far the most successful Warrior archetype, having received help from a rather unexpected source. Mithril Spellstone, a card most thought wouldn’t get close to a Pirate Warrior list, has proved to be highly useful, although more for its mana cost as opposed to its merit as a card, with the deck now playing it alongside Spiteful Summoner in order to guarantee a 4/4 and a random 7-cost minion for 6 mana whenever it comes down. This gives the deck more mid-game pressure, as a final knockout punch when the opponent is reeling from getting past the deck’s still formidable early game. Since Pirate Warrior is an aggressive deck, and is a Hearthstone deck, Corridor Creeper is also played. There are, of course, downsides to the Spellstone strategy – it requires playing two cards which are all but useless if you draw them, and it makes it impossible to play Upgrade!, previously a staple in the deck. However, these downsides are relatively minimal compared to the benefit gained from having such a strong game-ender. Karomizu’s list, the benchmark for the archetype, also plays Captain Greenskin for a little more staying power. The other slightly viable Warrior deck is the one everyone thought of at the original reveal of Kobolds & Catacombs, Big Warrior. Japanese player, Seven, managed to hit #1 legend early on in the expansion’s life with the archetype. His build utilizes many early game removal tools to try and fend off aggression long enough for big threats to come down. The deck also plays Forge of Souls in order to get more consistent access to Woecleaver. The deck is fun and interesting, but extremely inconsistent and reliant on drawing Gather your Party and not falling too far behind in the early game. Unlike Big Priest, it has a more limited amount of threats, which means it can actually get fatigued by other late game decks surprisingly often. On the whole, things aren’t looking too great for Warrior for another expansion. There’ve been plenty of high-quality Warrior cards released, but other classes have also improved and Warrior was just too far behind before the expansion to stand much of a chance. It’s difficult to imagine Warrior climbing higher than its #8 rank any time soon. We hope you’re ready for some bad news, because that’s all we have for you this week when it comes to the Shaman class. 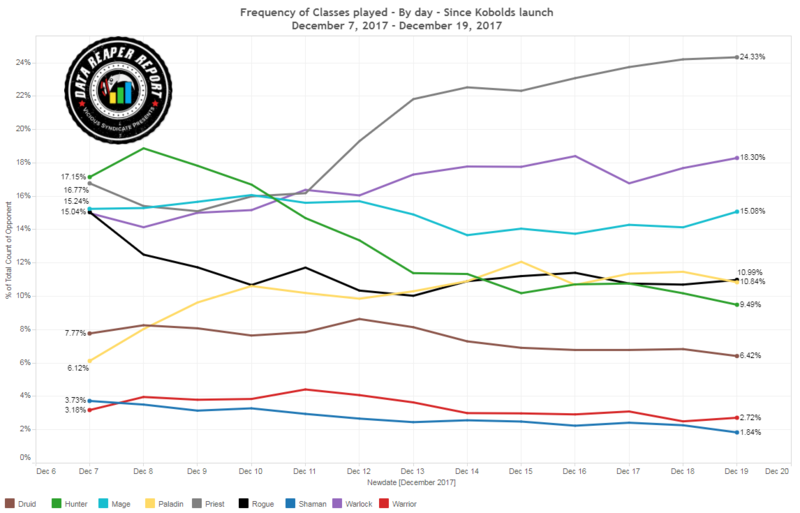 The arrival of Kobolds & Catacombs did nothing to uplift its sorry state, and the weakest class throughout most of KFT seems to have taken a massive dive towards the dumpster. While virtually all classes saw some changes once the expansion was released, Shaman remained almost static. These are certainly early days, but the signs aren’t good. The class’ only real archetype at the moment, Token Shaman, sees a fringe amounts of play. TwoBiers reached legend cutting Devolves for Corridor Creepers and adding 1 Unstable Evolution instead of Bloodlust. Slower Shaman decks still fail to provide any significant late game threat to the powerhouses of Warlock and Priest and have died out almost immediately. Though it isn’t happening quite yet, and it can be altered as a result of further developments, a meta cycle can be theorized which includes the most influential decks in the meta. It starts with the highest win rate deck in the game, which is Aggro Paladin. We expect this archetype to rise in play and bend other strategies to account for it more seriously. Tempo Rogue is the best response to an influx of Paladin since it does not allow it to establish initiative. Tempo Rogue is then punished by Control Warlock’s extremely strong defensive toolkit. Control Warlock’s anti-aggro prowess falls short when it reaches the late game against Razakus Priest, because no deck can consistently outlast Razakus Priest once it has assembled its win condition. In the control arms race between Priest and Warlock, Secret Mage becomes a formidable threat, which proceeds to be beaten by Aggro Paladin, and the cycle is complete. Break the cycle, and you break the meta. 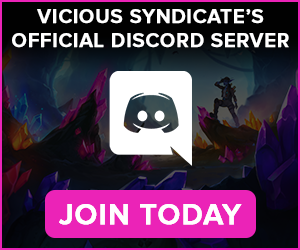 Special thanks to Leo G, Chungfr, Kognar, Aaron B, Jed M, Drew M, Alan J, lalasong, Eric L, Steve F, Batz, Jeffee83, Zolstar, Pink Mage Diaries, Dekkster Gaming, Connor L, Eric H, Lim E, Stefan D, Audun K, and Sean H for supporting us for the month of December. I don’t understand how the aggro paladin can have such a winrate. no steam in Danswf list, no resilience on your creature except for divine shield one. Your whole board is cleaned with a single one damage aoe. You can even go into fatigue without threatening your opponent. being 0-4 for the moment… trying a bit more, as I am capped level. But clearly, I cannot understand such a winrate. Call to Arms might be the card to mull for in aggro paladin, but in my experience Divine Favour is the MVP of murlocs. Because of paladins’ ability to vomit out their hand like never before, it’s at least an Arcane Intellect in most cases, and can easily draw 4-6 cards against priests and warlocks. It would be interesting to see a “Rock paper scissors index” to see how polarized the matchups are (weighted by their frequency of occurence).